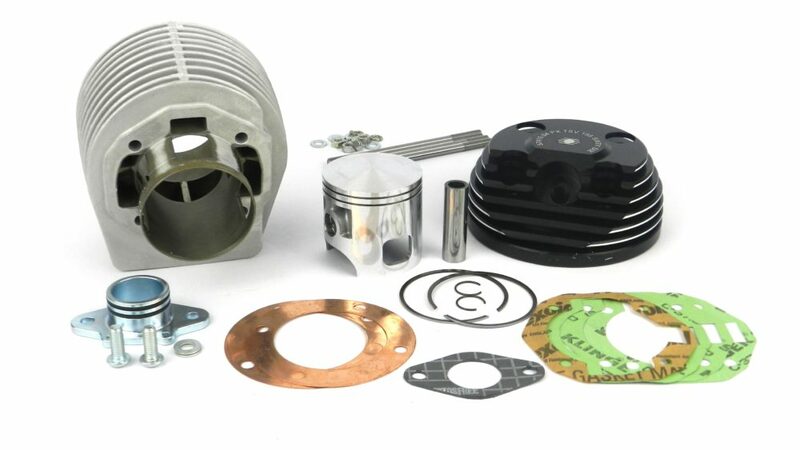 Italian Scooter parts specialist Parmakit has added two new 195-205 cc 66 mm ‘Big Bore’ cylinder kits to its performance “Sixty Six” line available for PX/LML 125/150 cc Vespa engine conversions. 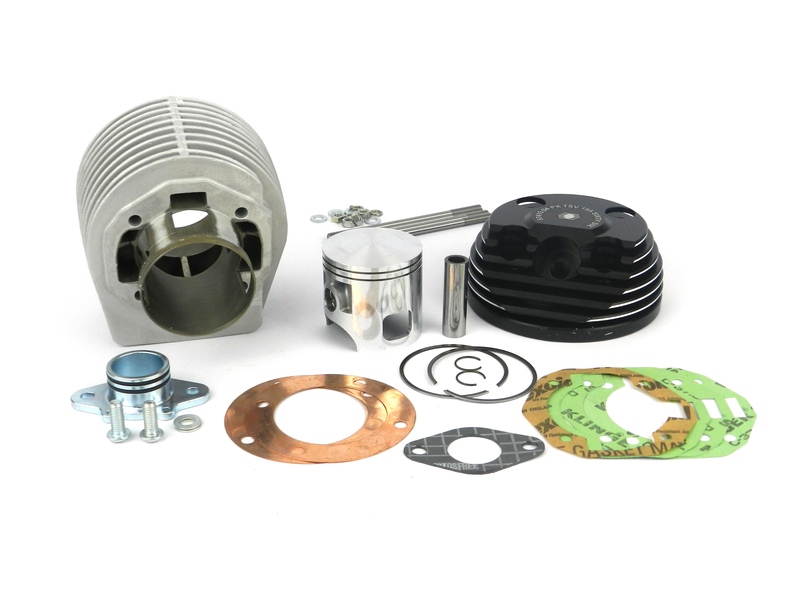 Both feature a bridged exhaust port, integral head (with side spark plug hole as appropriate) and come with a Vertex piston with two steel piston rings and gasket sets for variable timing (with added Viton O-ring for the LC 195 cc kit). Core business for Parmakit is the design and manufacture of alloy cylinders – the company was one of the first to experiment with and develop new technologies, manufacturing techniques and materials for alloy cylinders. Over the years the company has created a thorough and highly specialised processing cycle, such as gravity-fed foundry, CNC machining, durable nickelsilicon lining on the cylinder bore and more. With cast iron OE replacements and upgrades as well as its bench-tested alloy ‘Thermic Units’ performance upgrades (such as its “Sixty Six” programme), the company has created more than 50 brands on the market, with over 5,000 products in its range. For both ranges Parmakit also offers components such as crankshafts, fuel pump units, electronic ignitions, clutch baskets and more. The company is also a major player in off-road and scooter racing. Bridging the gap between the small and large block/large frame Vespa PX models, the radical 66 mm bore of the ‘Sixty Six’ cylinder brings them up to the same capacity of the original Vespa PX 200. When the 60 mm stroke version is combined with the separately available, complementary crankshaft, a total cubic capacity of 205 cc can be realised. The port layout remains “traditional” five transfer ports and a single ‘bridged’ exhaust with struts chamfered from behind to improve gas flow. On the opposite side of the cylinder the exhaust outlet is provided with a bolton flange, fully compatible with the original Piaggio exhaust mounting. The Vertex piston weighs 190 g, with its two 1.2 mm thick steel piston rings and the 16 mm gudgeon pin with clips, the total weight is 245 g; a 110 mm standard PX length crankshaft is needed. The combustion chamber has a 45 mm diameter and a variety of gaskets with differing thicknesses are included in order to adjust the transfer port timing and squish band clearance. Parmakit recommends a squish band clearance of between 1.3 mm and 1.4 mm. Some engine case modifications are needed, but in addition to being powerful, the Parmakit ‘Sixty Six’ is a thing of beauty. The ‘beehive’ styling and precision machining of the cylinder head is a work of art, with a black anodised surface finish and contrasting silver fin edges (that protrude 2.5 mm into the bore of the cylinder) for the kind of ‘contrast cut’ look that is popular throughout the custom world currently – close up it looks like a piece of performance jewellery and is tactile and architectural in equal measure.